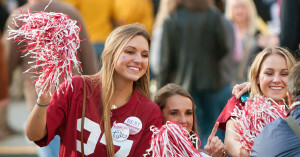 Alabama fans are on top of the world after defeating the Clemson Tigers in the second College Football Playoff Game Jan. 11, 2016. We were hoping for a great National Championship Game, and Clemson–Alabama did not disappoint! Deshaun Watson and Clemson fought hard to the bitter end, but Bama’s big plays were just too much for too long. The Crimson Tide earned its fourth national championship since 2009 with the final score of 45-40. We’ll be doing quarterly drawings for a Polar Bear Cooler, so sign up at https://thekickoffstore.com/coolest-fan-contest/and watch our Facebook Page for announcements of winners so you can tailgate this summer and fall while staying the coolest fan at the stadium. Nick Saban joins Bear Bryant as the only coaches in college football history to win five national titles. Speaking of dynasties, in this week’s FCS Championship game, North Dakota State won its fifth consecutive national title after defeating Jacksonville State. This time last year, everyone was talking about how Ohio State were favorites to dominate. Now there’s speculation that Clemson is likely to start 2016 ranked No. 1 with Watson a favorite for the next Heisman. The Crimson Tide will probably lose this year’s winner, Derrick Henry, and a lot of other talent, along with defensive coordinator Kirby Smart, who was named Georgia’s coach, but Saban never seems to have any problem reloading. To order our new Basketball newsletter, The Tipoff, call us at (423) 267-0953. The cost is $12 for 12 weeks of the most weekly comprehensive information on college basketball schedules, scores and results available on a weekly basis. The latest issue of The Kickoff, our 17th issue of the season, includes our Final Top 25, with Alabama, Clemson, Stanford, Ohio State and Oklahoma at the top. We include superlatives and upsets, plus trends from throughout the season. The issue includes stats and scores from all of the Bowl games and our final Power Ratings from the results. How does your team stack up among all 128 FBS schools? With the College Football Playoff done, the slate is wiped clean with all teams making a fresh start and their eyes on the prize this fall. Over the next several months, bragging rights will be redeemed and hopes build with potential. Will new coach hires empower teams to turn things around? Will the powerhouses suffer with the loss of talent? Which coaches will enter the new season feeling some heat to either deliver success or find new jobs? What weaknesses do schools need to find solutions? What new chess pieces will programs be able to move? Which teams will win the recruiting wars? What new weapons will teams add to their arsenals of talent? Who are the future high school and JUCO stars in the making? Which teams and players will actually live up to the hype? Which ones are destined to crack under the pressure of lofty expectations? Which players will return healed from injuries? Who will advance to the next level and enter the NFL draft early? How well are they expected to do? Can they compete in the different environment? These questions are part of what makes college football great: the anticipation of what can be achieved with the right talent, team chemistry and coaching. The Kickoff predicts which prospects have the potential to be future stars, elevate programs, or at least contribute right away. The Kickoff puts out 6 monthly issues between February and July covering recruiting, spring practice and transfer. We hope that if you haven’t already, you will invest in a full year subscription (23 issues for $28) to The Kickoff so you can have our information at your fingertips as momentum builds for another great year of college football! To subscribe to The Kickoff, visit https://thekickoffstore.com/subscriptions/individual/ or call us at (423) 267-0952. To talk to us about using The Kickoff as an advertising tool to reach your existing and new customers, visit https://thekickoffstore.com/subscriptions/business/ or call (423) 267-0952. It’s been a crazy week in college football with teams preparing for conference showdowns and the coaching carousel in full swing. Today all eyes will be on conference championship games that include #18 Florida vs #2 Alabama at the Georgia Dome (SEC), #10 North Carolina vs #1 Clemson at the Bank of America Stadium (ACC), #5 Michigan State vs #4 Iowa at Lucas Oil Stadium (Big Ten), #7 Stanford vs #20 USC at Levi’s Stadium (Pac-12), #22 Temple vs #19 Houston at TDECU Stadium (AAC), and Texas vs #12 Baylor at McLane Stadium (Big 12). Air Force and San Diego State play at Albertsons Stadium in Boise (MWC), while Western Kentucky and Southern Miss also face off (C-USA). Could the outcomes of this weekend’s games shake up the final College Football Playoff Rankings headed into bowl season? Most definitely! A loss this weekend by Clemson, Alabama or Iowa could have major ramifications on who plays for the national championship this year. The committee named those teams 1, 2 and 4 in the poll, with Oklahoma in the third spot. We feel the Sooners are the most dangerous team likely in the CFP. The first two teams out are Michigan State and Ohio State. The Kickoff’s Top 6 teams headed into Saturday are Clemson, Alabama, Oklahoma, Michigan State, Iowa, and Ohio State. It’s been an exciting and eventful week in college football – and not just because The Kickoff announced our Ultimate Tailgater Giveaway (see details at https://thekickoffstore.com/ultimate-tailgater-giveaway/ ). The media reported rumors that Les Miles’ time at LSU was coming to an end, but he’s still there while Georgia’s Mark Richt is bound for Miami, where Al Golden was fired. Alabama Defensive Coordinator Kirby Smart is expected to be announced as Richt’s replacement for the Bulldogs. East Carolina has fired Coach Ruffin McNeill after the Pirates finished 5-7 this season. Will Muschamp, fired last season as Florida’s head coach, is not expected to return as Auburn’s defensive coordinator if he’s offered Steve Spurrier’s old job at South Carolina instead of Rich Rodriguez. Other coaches getting the boot include Kyle Flood at Rutgers, Mike London at Virginia, Curtis Johnson at Tulane, Scott Shafer at Syracuse, Randy Edsall at Maryland, and Dan McCarney at North Texas. USC fired Steve Sarkisian after his earlier leave of absence. Missouri defensive coordinator Barry Odom has been named that program’s new coach, replacing Gary Pinkel, whose retirement became effective after the Tigers’ season-ending loss to Arkansas on Nov. 27. Arizona State offensive coordinator Mike Norvell is headed to Memphis after former head coach Justin Fuente accepted the head coaching position at Virginia Tech. Illinois hired interim coach Bill Cubit to a two-year contract. Southern Cal named Clay Helton its permanent head coach. ​Nevada offensive coordinator Nick Rolovich was hired as Hawaii’s head coach. After accepting George O’Leary’s resignation, UCF also hired an offensive coordinator, Scott Frost of Oregon, as its head coach. Offensive coordinator Jason Candle Matt Campbell will take over at Toledo for Matt Campbell, who is accepting the head coaching job at Iowa State. Michigan Defensive Coordinator DJ Durkin is expected to become Maryland’s new head coach. These coaches will have eight months to begin building programs at their new schools, each striving to become successful enough to have the word “era” follow their names in the history books. Speaking of next year’s teams, The Kickoff is offering an Early Bird Special this holiday season that allows you to buy a full year email/PDF subscription (23 issues, including six monthly issues starting this February covering recruiting, spring practice and transfers, along with 17 weekly issues next fall) for just $28 PLUS you can get an additional email/PDF subscription to give a friend for FREE. To take advantage of this limited time offer, enter your email address and the address of your friend when checking out from our website (https://thekickoffstore.com/product/buy-one-get-one-free/ ) or place your order by calling (423) 267-0953. Have fun watching this weekend’s conference championship games and speculating on which coach will land where. It’s Rivalry Week in College Football and anything can happen. When you’re facing your hated rivals, pride and braggin’ rights matter almost as much as championship runs. These are some of the greatest matchups in all of college football because they matter so much to the fans. People will debate which rivalry is the most heated, but to most of us, this time it’s personal. What follows the expiration of time this weekend may be 365 days of teasing from “those” fans. Bert Caldwell, one of the principle owners of The Kickoff, said big games against rivals should make predicting the outcome of the committee’s final rankings interesting. “Top-ranked Clemson still has to play at South Carolina and No. 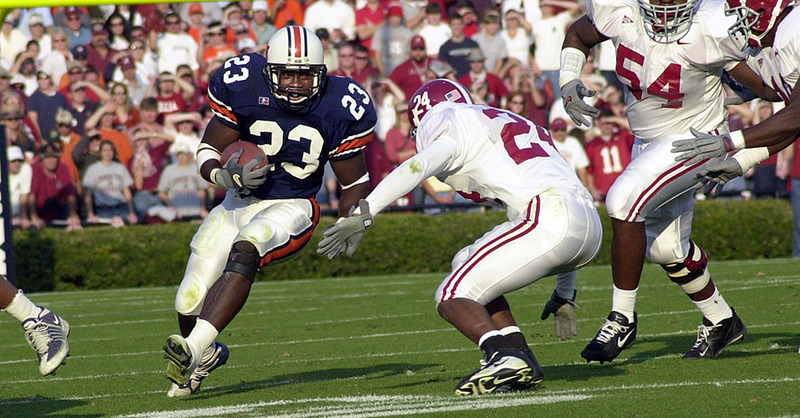 2 Alabama will play in Auburn in the Iron Bowl,” Caldwell said, noting that big rivalry games can inspire teams having bad seasons to rise to the occasion. Speaking of which, it will be interesting to see what the College Football Playoff Committee decides November 24 following No. 3 Ohio State’s 17-14 loss to No. 9 Michigan State on November 21. TCU, Wisconsin and Houston are out after Week 12 losses. In the Kickoff Top 25, we saw the Buckeyes drop all the way from No. 2 to No. 8, with Alabama advancing to No. 2 behind Clemson. Oklahoma jumped from No. 6 to No. 3 in our poll while Michigan State fills out the No. 4 spot. Baylor rounds out our Top 5 teams in the country this week. Our Kickoff Games of the Week will be Oklahoma at Oklahoma State and Ohio State at Michigan. This week we are also hearing rumblings that LSU may part ways with Les Miles, who has won a national championship and two SEC championships and averaged 10 wins per season, yet lost three consecutive games to Alabama, Arkansas and Ole Miss, dropping out of the AP Poll on Sunday after winning their first seven games and having Playoff and Heisman buzz. If you aren’t getting The Kickoff, it’s not too late to subscribe to the rest of the 2015 college football season. A 5 week subscription, which includes this week’s issue, is just $5.90. This week, The Kickoff is launching our Ultimate Tailgater Contest. We’re giving away a YETI Cooler! YETI is the cooler of choice for outdoor enthusiasts, tailgaters and backyard barbeque kings. The rugged and durable Roadie 20, which retails for $249.99, will hold up to 14 cans and 20 pounds of ice. That will keep the party going for a while! We’ll do a random drawing December 21st so don’t miss out on this “cool” prize. One entry per person. Ohio State (No. 2 in the Kickoff Top 25, No. 3 in the College Football Playoff rankings) faces a test this weekend as it hosts Michigan State (No. 11 on the Kickoff Top 25, No. 9 in the CFP rankings) in one of our Kickoff Games of the Week. The Buckeyes lead the series 29-13, and we expect them to prevail again this week. We’ll see, though, as the kickoff is scheduled for 3:30 pm, televised on ABC. An Ohio State loss would shake things up in the Playoff picture. ESPN’s College GameDay will broadcast from Columbus Saturday morning, the first time on campus since 2010. Clemson (10-0) and Alabama (9-1) are ahead of Ohio State with Notre Dame (9-1) immediately trailing. The Kickoff Top 25 has Oklahoma State (10-0) ahead of the Fighting Irish in the No. 4 spot. Their game against Baylor (8-1, No. 10) is our other Game of the Week. When hosting, as they are Saturday, the Cowboys have a 12-4 record, and Oklahoma State leads the series all-time 19-14. A look at the Kickoff Power Ratings suggests the Bears may leave disappointed, which would end their playoff hopes. Kickoff is at 7:30 PM in Stillwater with the game airing on FOX. If you subscribe to The Kickoff, you have a powerful resource at your fingertips for making your weekly picks. It’s not too late to subscribe to the rest of the 2015 college football season. A 6 week subscription, which includes this week’s issue, is just $7.08. As mentioned above, there’s still a lot of football left to play. Visit http://bit.ly/1Hbl1Rr to get a prorated subscription or call us at (423) 267-0953 if you prefer to do it that way. Other big games worth checking out this weekend: No. 18 TCU at No. 7 Oklahoma, California at No. 11 Stanford, No. 15 LSU at No. 22 Ole Miss, No. 24 USC at No. 23 Oregon, No. 20 Northwestern at No. 25 Wisconsin, and No. 17 North Carolina at Virginia Tech in Frank Beamer’s final home game. In this week’s issue of The Kickoff, we looked at last weekend’s upsets as Arkansas topped LSU, Oklahoma beat Baylor, Oregon topped Stanford, and Missouri beat BYU, among others. The Kickoff Thermostat showed Pittsburgh, Oregon and Iowa on the rise, with the stock of Auburn, Duke and Stanford falling. In our Top 25, Alabama, Notre Dame, Houston, Northwestern, and Iowa jumped two spots. Michigan State, USC, Florida, and Arkansas jumped 3 spots. Oklahoma jumped 7 spots. Falling after last week’s upsets were Baylor, Stanford, LSU, and Utah, while BYU dropped out of our Top 25. The Kickoff looked at the overall trends through last week, listed the complete FBS and select FCS schedules and standings, examined the average points allowed by teams and strength of schedule, broke down the conferences’ winning percentages, and offered Power Ratings for this weekend’s games. We also looked back to the rankings in November 1963, when Texas led the nation with a 9-0 record. In News and Notes, we recognized the superlatives of Ezekiel Elliot, Brandon Radcliff, Jake Ruddock, Derrick Henry, Jehu Chesson, Jordan Howard, Alex Collins, and Sterling Shepard. This holiday season, The Kickoff is offering an Earlybird Special for those who get the jump on college football in 2016. For that relative who can’t get enough of the game, you can buy him (or her) an annual email/PDF subscription, which includes six pre-season issues and 17 weekly issues next fall – and you’ll get an email/PDF version for yourself or someone else at no additional charge! The cost is just $28 for 23 printed issues in the Email/PDF version. As one of the most accurate prognosticators since 1951, The Kickoff is the perfect gift for someone who loves college football as much as you do! Visit https://thekickoffstore.com/product/buy-one-get-one-free/ to get the Holiday Special. Watch this week for our announcement of an exciting new contest for new newsletter subscribers as well as existing subscribers. Use the hashtag #thekickoff on Facebook and Twitter so we can follow your conversations about this week’s games. Four strong teams — Clemson, Ohio State, Alabama and Notre Dame – are in the new College Football Playoff rankings, but there’s still way too much football left to be played for their fans to get too excited. “Top-ranked Clemson still has to play at South Carolina and No. 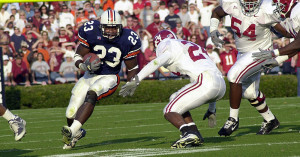 2 Alabama will play in Auburn in the Iron Bowl,” Caldwell said, noting that big rivalry games can inspire teams having bad seasons to rise to the occasion. Although defeat is unlikely the Tigers and the Tide could struggle in the final week of the regular season if they are caught looking too far ahead and underestimate their opponents. “You do not necessarily have to lose a game to slip in the poll. No. 11 Florida — which had a tight win last week against Vanderbilt — still has to play No. 16 Florida State. No. 6 and undefeated Baylor still has to play No. 12 Oklahoma, No. 8 Oklahoma State, No. 15 TCU, and Texas. No. 3 Ohio State, while also undefeated, still has to play Michigan State and Michigan, which come in at Nos. 13 and 14, respectively, on the committee’s Top 25,” Caldwell said. In other words, an upset or two and some hard-nosed, high stakes elimination football could shake things up pretty quickly. Speaking of upsets, last week we saw Auburn beat Texas A&M 26-10, Arkansas defeated Ole Miss 53-52, Nebraska beat Michigan State 39-38, and Oklahoma State defeated TCU 49-29. LSU was ranked at No. 2 on The Kickoff’s own Top 25, behind only TCU. 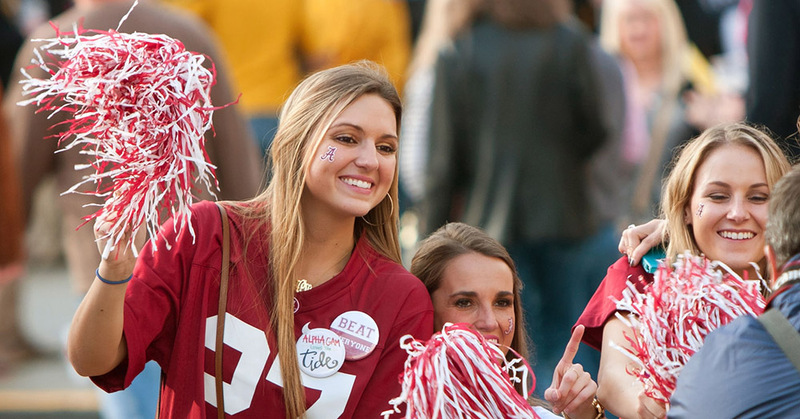 After Alabama’s convincing win, we have the Tide ranked No. 5 (behind undefeateds Clemson, Ohio State, Oklahoma, and Baylor) with LSU tumbling to No. 8 and TCU coming in at No. 9. Stanford and Notre Dame are Nos. 6 and 7, respectively, while Utah rounds out our Top 10 teams. Our Kickoff Games of the Week are No. 13 Oklahoma at No. 4 Baylor and Memphis at No. 16 Houston. We’re expecting Baylor and Houston to prevail in those contests. Both series have been pretty lopsided in the past, with Oklahoma leading Baylor 20-3 and Houston leading Memphis 14-9. In this week’s issue, The Kickoff shared a conference breakdown through issue 11, presented our Kickoff Thermostat, listed FBS and select FCS standings, shared schedules and scores for teams throughout the country, charted the legacy of retiring Virginia Tech Coach Frank Beamer, examined overall trends for home and road favorites, presented our Power Ratings for this week’s games, and more. It’s not too late to subscribe to the rest of the 2015 college football season. A 7 week subscription, which includes this week’s issue, is just $8.26. As mentioned above, there’s still a lot of football left to play. Visit http://bit.ly/1MKV8ni to get a prorated subscription or call us at (423) 267-0953 if you prefer to do it that way. This holiday season, The Kickoff is offering an earlybird special for those who get the jump on college football in 2016. For that relative who can’t get enough of the game, you can buy him (or her) an annual subscription, which includes six pre-season issues and 17 weekly issues next fall – and you’ll get an email/PDF version of The Kickoff for yourself or someone else at no additional charge! The cost is just $45 for 23 printed issues delivered First Class US Mail or $28 for the Email/PDF version. As one of the most accurate prognosticators since 1951, The Kickoff is the perfect gift for someone who loves college football as much as you do!